"WNBA" redirects here. For other uses, see WNBA (disambiguation). The Women's National Basketball Association (WNBA) is a professional basketball league in the United States. It is currently composed of twelve teams. The league was founded on April 24, 1996, as the women's counterpart to the National Basketball Association (NBA), and league play started in 1997. The regular season is played from May to September with the All Star game being played midway through the season in July and the WNBA Finals at the end of September until the beginning of October. Six WNBA teams have direct NBA counterparts and play in the same arena: the Atlanta Dream, Indiana Fever, Los Angeles Sparks, Minnesota Lynx, Phoenix Mercury, and Washington Mystics. The Chicago Sky, Connecticut Sun, Dallas Wings, Las Vegas Aces, New York Liberty, and Seattle Storm do not share an arena with a direct NBA counterpart, although three of the six (the Sky, the Wings, and the Liberty) share a market with an NBA counterpart, and the Storm shared an arena and market with an NBA team at the time of its founding. The Dream, the Sky, the Sun, the Wings, the Aces, the Sparks, and the Storm are all independently owned. The creation of the WNBA was officially approved by the NBA Board of Governors on April 24, 1996, and announced at a press conference with Rebecca Lobo, Lisa Leslie, and Sheryl Swoopes in attendance. The new WNBA had to compete with the recently formed American Basketball League, another professional women's basketball league that began play in 1996. The WNBA began with eight teams: the Charlotte Sting, Cleveland Rockers, Houston Comets and New York Liberty in the Eastern Conference; and the Los Angeles Sparks, Phoenix Mercury, Sacramento Monarchs and Utah Starzz in the Western Conference. While not the first major women's professional basketball league in the United States (a distinction held by the defunct WBL), the WNBA is the only league to receive full backing of the NBA. The WNBA logo, "Logo Woman", paralleled the NBA logo and was selected out of 50 different designs. On the heels of a much-publicized gold medal run by the 1996 USA Basketball Women's National Team at the 1996 Summer Olympic Games, the WNBA began its first season on June 21, 1997 to little fanfare. The first WNBA game featured the New York Liberty facing the Los Angeles Sparks in Los Angeles. The game was televised nationally in the United States on the NBC television network. At the start of the 1997 season, the WNBA had television deals in place with NBC (NBA rights holder), and the Walt Disney Company and Hearst Corporation joint venture channels, ESPN and Lifetime Television Network, respectively. Penny Toler scored the league's first point. The WNBA centered its marketing campaign, dubbed "We Got Next", around stars Rebecca Lobo, Lisa Leslie and Sheryl Swoopes. In the league's first season, Leslie's Los Angeles Sparks underperformed and Swoopes sat out much of the season due to her pregnancy. The WNBA's true star in 1997 was WNBA MVP Cynthia Cooper, Swoopes' teammate on the Houston Comets. The Comets defeated Lobo's New York Liberty in the first WNBA Championship game. The initial "We Got Next" advertisement ran before each WNBA season until it was replaced with the "We Got Game" campaign. Two teams were added in 1998 (Detroit and Washington) and two more in 1999 (Orlando and Minnesota), bringing the number of teams in the league up to twelve. The 1999 season began with a collective bargaining agreement between players and the league, marking the first collective bargaining agreement to be signed in the history of women's professional sports. The WNBA also announced in 1999 that it would add four more team for the 2000 season (the Indiana Fever, the Seattle Storm, the Miami Sol, and the Portland Fire), bringing the league up to 16 teams, with WNBA President Val Ackerman discussing expansion: "This won't be the end of it. We expect to keep growing the league." In 1999, the league's chief competition, the American Basketball League, folded. Many of the ABL's star players, including several Olympic gold medalists (such as Nikki McCray and Dawn Staley) and a number of standout college performers (including Kate Starbird and Jennifer Rizzotti), then joined the rosters of WNBA teams and, in so doing, enhanced the overall quality of play in the league. When a lockout resulted in an abbreviated NBA season, the WNBA saw faltering TV viewership. On May 23, 2000, the Houston Comets became the first WNBA team to be invited to the White House Rose Garden. Before this invitation, only men's sports teams had traveled to the White House. At the end of the 2000 season, the Houston Comets won their fourth championship, capturing every title since the league's inception. Led by the "Big Three" of Sheryl Swoopes, Tina Thompson, and four-time Finals MVP Cynthia Cooper, the Comets dominated every team in the league. Under head coach Van Chancellor, the team posted a 98–24 record through their first four seasons (16–3 in the Playoffs). After 2000, Cooper retired from the league and the Comets dynasty came to an end. The top contender in the 2001 season was the Los Angeles Sparks. Led by Lisa Leslie, the Sparks posted a regular-season record of 28–4. They advanced to their first ever WNBA Finals and swept the Charlotte Sting. Looking to repeat in 2002, the Sparks again made a strong run toward the postseason, going 25–7 in the regular season under head coach Michael Cooper, formerly of the Los Angeles Lakers. Again, Leslie dominated opponents throughout the Playoffs, leading the Sparks to a perfect 6–0 record through all three rounds, beating the New York Liberty in the 2002 Finals. Teams and the league were collectively owned by the NBA until the end of 2002, when the NBA sold WNBA teams either to their NBA counterparts in the same city or to a third party, as a result of the dot-com bubble. This led to two teams moving: Utah moved to San Antonio, and Orlando moved to Connecticut and became the first WNBA team to be owned by a third party instead of an NBA franchise. This sale of teams also led to two teams folding, the Miami Sol and Portland Fire, because new owners could not be found. The WNBA Players Association threatened to strike in 2003 if a new deal was not worked out between players and the league. The result was a delay in the start of the 2003 preseason. The 2003 WNBA Draft was also delayed and negative publicity was gained from this strike. After taking over a struggling franchise in 2002, former Detroit Pistons forward Bill Laimbeer had high hopes for the Detroit Shock in 2003. The team was just 9–23 in 2002. The Shock had three all-stars in the 2003 All-Star Game (Swin Cash, Cheryl Ford, and Deanna Nolan). Laimbeer orchestrated a worst-to-first turnaround and the Shock finished the season 25–9 in first place in the Eastern Conference. Winning the first two rounds of the Playoffs, the Shock faced two-time champion Los Angeles Sparks and Lisa Leslie in the 2003 Finals. The Shock beat the Sparks, winning game three on a three-pointer by Deanna Nolan. After the 2003 season, the Cleveland Rockers, one of the league's original eight teams, folded because the owners were unwilling to continue operating the franchise. Val Ackerman, the first WNBA president, resigned effective February 1, 2005, citing the desire to spend more time with her family. Ackerman later became president of USA Basketball. On February 15, 2005, NBA Commissioner David Stern announced that Donna Orender, who had been serving as the Senior Vice President of the PGA Tour and who had played for several teams in the now-defunct Women's Pro Basketball League, would be Ackerman's successor as of April 2005. The WNBA awarded an expansion team to Chicago (later named the Sky) in February 2006. In the off-season, a set of rule changes was approved that made the WNBA more like the NBA. In 2006, the league became the first team-oriented women's professional sports league to exist for ten consecutive seasons. On the occasion of the tenth anniversary, the WNBA released its All-Decade Team, comprising the ten WNBA players to have contributed, through on-court play and off-court activities, the most to women's basketball during the league's existence. After missing out on the Finals in 2004 and 2005, the Shock bounced back in 2006 behind newly acquired Katie Smith, along with six remaining members from their 2003 Finals run (Cash, Ford, Holland-Corn, Nolan, Powell, and Riley). The Shock finished second in the Eastern Conference, and knocked off first-seeded Connecticut in the second round of the Playoffs. The Shock faced reigning champion Sacramento Monarchs in a five-game series. The Shock won game five on their home floor. In December 2006, the Charlotte Bobcats organization announced it would no longer operate the Charlotte Sting. Soon after, the WNBA announced that the Sting would not operate for 2007. A dispersal draft was held January 8, 2007. Teams selected in inverse order of their 2006 records; Chicago received the first pick. Former Los Angeles Lakers championship coach Paul Westhead was named head coach of the Phoenix Mercury on October 11, 2005, bringing his up-tempo style of play to the WNBA. This fast-paced offense was perfect for his team, especially after the league shortened the shot clock from 30 seconds to 24 seconds in 2006. Much like the early Houston Comets championship teams, the Phoenix Mercury had risen to prominence led by their own "Big Three" of Cappie Pondexter, Diana Taurasi, and Penny Taylor. The Mercury were well-suited for fast offense behind these three players. Phoenix averaged a league-record 88.97 points per game in 2007; teams could not keep up with the new style of play, and the Mercury were propelled into first place in the Western Conference. Facing the reigning champion Detroit Shock, the Mercury imposed their high-scoring offense with hopes of capturing their first title in franchise history. Averaging 93.2 points per game in the Finals series, the Mercury beat Detroit on their home floor in front of 22,076 fans in game five to claim their first ever WNBA title. In October 2007 the WNBA awarded another expansion franchise to Atlanta. Atlanta businessman Ron Terwilliger was the original owner of the new team. Citizens of Atlanta were able to vote for their choices for the new team's nickname and colors. The Dream, as they were named, played their first regular season game on May 17, which was a 67–100 loss to the Connecticut Sun. Paul Westhead resigned from the Mercury after capturing the 2007 title and Penny Taylor opted to stay home to prepare for the 2008 Summer Olympics, causing the Mercury to falter in 2008. The team posted a 16–18 record and became the first team in WNBA history to miss the Playoffs after winning the championship in the previous season. In their place, the Detroit Shock won their third championship under coach Bill Laimbeer, solidifying their place in WNBA history before Laimbeer resigned early in 2009, effectively ending the Shock dynasty. During the 2008 regular season, the first ever outdoor professional basketball game in North America was played at Arthur Ashe Stadium in New York City. The Indiana Fever defeated the New York Liberty 71–55 in front of over 19,000 fans. Late in 2008, the WNBA took over ownership of one of the league's original franchises, the Houston Comets. The Comets ceased operations on December 1, 2008 after no owners for the franchise could be found. 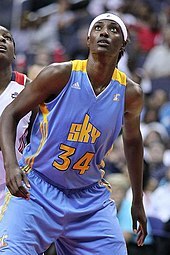 A dispersal draft took place on December 8, 2008 and with the first pick, Sancho Lyttle was taken by the Atlanta Dream. After an unsatisfying conclusion in 2008, the Mercury looked to bounce back to championship caliber. New head coach Corey Gaines implemented Paul Westhead's style of play, and the Mercury averaged 92.82 points per game throughout the 2009 season. Helped by the return of Penny Taylor, the Mercury once again locked up first place in the Western Conference and advanced to the 2009 Finals. The championship series was a battle of contrasting styles as the Mercury (number one league offense, 92.82 points per game) had to face the Indiana Fever (number three league defense, 73.55 points per game). The series went five games, including arguably one of the most thrilling games in WNBA history in game one of the series (Phoenix won in overtime, 120–116. The Mercury beat the Fever in game five, this time on their home court, to capture their second WNBA championship. Not only did Paul Westhead's system influence his Mercury team, but it created a domino effect throughout the league. Young athletic players were capable of scoring more and playing at a faster pace. As a league, the 2010 average of 80.35 points per game was the best ever, far surpassing the 69.2 average in the league's inaugural season. On October 20, 2009, the WNBA announced that the Detroit Shock would relocate to Tulsa, Oklahoma; the team is called the Tulsa Shock. On November 20, 2009, the WNBA announced that the Sacramento Monarchs had folded due to lack of support from its current owners, the Maloof family, who were also the owners of the Sacramento Kings at the time. The league announced it would seek new owners to relocate the team to the San Francisco Bay area; however, no ownership was found and a dispersal draft was held on December 14, 2009. The 2010 season saw a tight race in the East, with three teams being tied for first place on the final day of the regular season. Five of the six teams in the East were in first place at some point during the season. The East held a .681 winning percentage over the West, its highest ever. In the 2010 Finals, two new teams represented each conference: the Seattle Storm and the Atlanta Dream. Seattle made their first finals appearance since winning it all in 2004 and Atlanta, coming into the playoffs as a four seed, impressively swept its opponents in the first two rounds to advance to the Finals in only the third year of the team's existence. After the 2010 season, President Orender announced she would be resigning from her position as of December 31. On April 21, 2011, NBA commissioner David Stern announced that former Girl Scouts of the USA Senior Vice President and Chief Marketing Officer Laurel J. Richie would assume duties as President on May 16, 2011. The 2011 season began with strong publicity helped by the rising young stars of the league and the NBA lockout. The 2011 NBA lockout began on July 1, 2011. Unlike the previous lockout, which affected the WNBA, president Laurel J. Richie confirmed that this lockout would have no effect on the WNBA. If the NBA season was shortened or canceled, the 2012 WNBA season (including the WNBA teams still owned by NBA owners) would run as planned. The lockout ended on November 26, and NBA teams would play a 66-game regular season following the lockout. Many news outlets began covering the league more frequently. NBA TV, the television home of the NBA scheduled over 70 regular season games to be televised (along with a dozen more on ESPN2 and ABC). The new influx of young talent into the league gave many teams something to be excited about. Players like Candace Parker of the Sparks, Maya Moore of the Lynx, DeWanna Bonner of the Mercury, Angel McCoughtry of the Dream, Sylvia Fowles of the Sky, Tina Charles of the Sun, and Liz Cambage of the Shock brought a new level of excitement to the game, adding talent to the teams of young veterans such as Diana Taurasi, Seimone Augustus and Cappie Pondexter. The level of play seemed to be evidenced by higher scoring, better defense, and higher shooting percentages. By the end of the 2011 regular season, nine of the twelve teams in the league had increased attendance over their 2010 averages. Connecticut Sun center Tina Charles set a league record for double-doubles in a season with 23. Also, Sylvia Fowles of the Chicago Sky became only the second player in WNBA history to finish a season averaging at least 20 points (20.0ppg) and 10 rebounds (10.2rpg) per game. The San Antonio Silver Stars experienced boosts from their young players as well; rookie Danielle Adams scored 32 points off the bench in June and fellow rookie Danielle Robinson had a 36-point game in September. Atlanta Dream forward Angel McCoughtry was the first player in league history to average over 20 points per game (21.6ppg) while playing under 30 minutes per game (27.9mpg). McCoughtry led her team to the Finals for the second straight year, but despite breaking her own Finals scoring record, the Dream was swept for the second straight year, this time by the Minnesota Lynx, which won its first title behind a fully healthy Seimone Augustus. 2012 featured a long Olympic break. The Indiana Fever won that year's WNBA championship. The much publicized 2013 WNBA Draft produced Baylor University star Brittney Griner, Delaware's Elena Delle Donne, and Notre Dame All American Skylar Diggins (now Diggins-Smith) as the top three picks, the draft was the first to be televised in primetime on ESPN. Griner, Delle Donne, and Diggins were thus labelled "The Three To See", but with the draft also came standouts such as Tayler Hill, Layshia Clarendon and Alex Bentley. The retirement of legends Katie Smith, Tina Thompson, Ticha Penicheiro, and Sheryl Swoopes coupled with the arrival of highly touted rookies and new rule changes effectively marked the end of an era for the WNBA and the ushering of another. On the court, the Minnesota Lynx won their second title in three years, defeating the Atlanta Dream in the Finals, and becoming the first team to sweep the playoff since the Seattle Storm. The promotion of Griner, Delle Donne, and Diggins helped boost television ratings for the league by 28 percent, and half of teams ended the season profitable. The improved health of the league was on display after the season, when the Los Angeles Sparks' ownership group folded; it took the league only a few weeks to line up Guggenheim Partners to purchase the team, and the franchise also garnered interest from the ownership of the Golden State Warriors. The WNBA originated with 8 teams in 1997, and through a sequence of expansions, contractions, and relocations currently consists of 12 teams. There have been a total of 18 franchises in WNBA history. As of the league's most recent 2018 season, the Las Vegas Aces (formerly the Utah Starzz and San Antonio (Silver) Stars), Los Angeles Sparks, New York Liberty, and Phoenix Mercury are the only remaining franchises that were founded in 1997. Arenas listed below reflect those expected to be in use for the league's next season in 2019. An asterisk (*) in the table above denotes a franchise move; an italicized name in the associated map denotes the former presence of a franchise under that name at the location shown. See the respective team articles for more information. ^ Due to upcoming renovations to KeyArena, the Storm will play home games at Alaska Airlines Arena on the campus of the University of Washington in 2019. Seven WNBA teams are associated with an NBA team from the same market and are known as sister teams. These teams include the Brooklyn Nets and New York Liberty, the Indiana Pacers and Fever, the Los Angeles Lakers and Sparks, the Minnesota Timberwolves and Lynx, the Phoenix Suns and Mercury, the Atlanta Hawks and the Dream, and the Washington Wizards and Mystics. Of these teams, only the Dream and the Sparks have completely separate ownership. The Liberty had been associated with the New York Knicks, having been owned by the Knicks' parent company, The Madison Square Garden Company, but the team was sold in January 2019 to a group led by a minority owner of the Nets. Through the 2017 season, the San Antonio Spurs and Stars were also paired, but that relationship ended in October 2017 when the Stars were bought by MGM Resorts International and moved to Las Vegas. Three WNBA teams are in the same market as an NBA team but are not affiliated. Though located in the same market, the Chicago Sky are not affiliated with the Bulls, as evidenced by their differing home arenas: the Sky play at Wintrust Arena in Chicago's Near South Side, while the Bulls play at United Center in the city's Near West Side. The Dallas Wings, which had been the Tulsa Shock before moving to the Dallas–Fort Worth Metroplex after the 2015 season, are not affiliated with the existing NBA team in the Metroplex, the Dallas Mavericks. As with the Sky and Bulls, the Wings and Mavericks play in different arenas, with the Wings playing at College Park Center in Arlington as opposed to the Mavericks playing just outside downtown Dallas at American Airlines Center. The remaining WNBA team, the Seattle Storm, was formerly the sister team of the now relocated SuperSonics but was sold to a Seattle-based group before the SuperSonics moved and become the Oklahoma City Thunder. The now defunct Charlotte Sting, Miami Sol, Portland Fire, Cleveland Rockers, Orlando Miracle, Houston Comets and Sacramento Monarchs were also sister teams of the Hornets, Heat, Trail Blazers, Cavaliers, Magic, Rockets and Kings, respectively. The Utah Starzz were affiliated with the Jazz before relocating to San Antonio as the Silver Stars under the ownership of the parent company of the Spurs in 2003. Becoming the Stars in 2014, they shared the Spurs' team colors. The team would eventually relocate to Las Vegas as the Aces in 2017. The Detroit Shock was the sister team of the Pistons until the teams' owner sold the Shock to investors who moved the team to Tulsa, Oklahoma. During its tenure in Tulsa, it was not affiliated with Oklahoma's NBA team, the Oklahoma City Thunder. Four teams share a market with an NBA G League team. Two of these not only share markets but also arenas—the Liberty share the New York City market with the Long Island Nets and Westchester Knicks, also sharing an arena with the latter team; and the Mystics share Washington, D.C. and St. Elizabeths East Arena with the Capital City Go-Go. In addition, the Sparks share the Los Angeles market with the Agua Caliente Clippers and South Bay Lakers, and the Wings share the Dallas market with the Texas Legends. Three other teams are located within 150 miles of WNBA teams (the Delaware Blue Coats, Fort Wayne Mad Ants, and Northern Arizona Suns being near the Mystics, Fever, and Mercury, respectively). The Stars were also within 150 miles of a G League team (the Austin Spurs) before their move to Las Vegas. One more WNBA team will share markets with G League teams in the near future. The Dream will be joined by the College Park Skyhawks in 2019–20. The Shock shared the Tulsa market with the Tulsa 66ers until the latter team was relocated to become the Oklahoma City Blue in 2014. Maya Moore of the Minnesota Lynx, MVP of the 2014 WNBA Season. Teams hold training camps in May. Training camps allow the coaching staff to prepare the players for the regular season, and determine the 12-woman roster with which they will begin the regular season. After training camp, a series of preseason exhibition games are held. The WNBA regular season begins in May. During the regular season, each team plays 34 games, 17 each home and away. Each team plays one in-conference team 4 times and the remaining in-conference teams 3 times each (16 games). Each team then plays the six out-of-conference teams 3 times (18 games). As in the NBA, each team hosts and visits every other team at least once every season. During years in which the Summer Olympics are held, the WNBA takes a month off in the middle of the season to allow players to practice and compete with their respective national teams. In 1999 the league held its first ever All Star Game where the best players of the Eastern Conference played against the best players of the Western Conference. Since the All Star games were ongoing, the West has been dominant until 2006, when the East finally won a game. In July, the regular season pauses to celebrate the annual WNBA All-Star Game. The game is part of a weekend-long event, held in a selected WNBA city each year. The actual game is played on the selected WNBA team's home court. The All-Star Game features star players from the Western Conference facing star players from the Eastern Conference. During the season, fans vote for the players they would like to see start the game. In 2004, The Game at Radio City was in held in place of a traditional All-Star Game. The 2006 All-Star Game was the first game to feature custom uniforms that match the decade anniversary logo. No WNBA All-Star Game is held in every Olympic year since 2008. In 2010, an exhibition game (Stars at the Sun) was held. Shortly after the All-Star break is the trading deadline. After this date, teams are not allowed to exchange players with each other for the remainder of the season, although they may still sign and release players. Major trades are often completed right before the trading deadline. The WNBA Playoffs usually begin in late September, though in years of the FIBA World Cup they begin in August. In the current system, the eight best teams by regular-season record, without regard to conference alignment, qualify for the playoffs. Having a higher seed offers several advantages. Since the first two seeds get double byes, and the next two seeds get first-round byes, having a higher seed generally means one will be facing a weaker team. The team in each series with the better record has home-court advantage. Since 2016 Verizon is the official sponsor. The first two playoff rounds follow a tournament format with each team playing a rival in a single-elimination game, with the winners advancing to the next round and losers being eliminated from the playoffs. For the first round, the matchups by seed are 5th vs 8th and 6th vs 7th. In the second round, the matchups by seed are 3rd vs the lowest remaining seed and 4th vs the highest remaining seed. In the semifinals, the matchups by seed are 1st vs the lowest remaining seed and 2nd vs the highest remaining seed. This leaves two teams left to play each other in the WNBA Finals. The first and second rounds consist of single-elimination games, while the semifinals are best-of-five series using a 2–2–1 home-court pattern, meaning that the higher-seeded team will have home court in games 1, 2, and 5 while the other team plays at home in game 3 and 4. This pattern has been in place since 2016 (changed from the best-of-three series 1–1–1 format for four teams in each conferences, where the higher seed hosted the opening game in the first two rounds). The final playoff round, a best-of-five series between the two semifinal winners, is known as the WNBA Finals, and is held annually, currently scheduled for October. Each player on the winning team receives a championship ring. In addition, the league awards a WNBA Finals Most Valuable Player Award. For this round, the series follows a 2–2–1 pattern, meaning that one team will have home court in games 1, 2, and 5, while the other plays at home in games 3 and 4. The 2–2–1 pattern in the WNBA Finals has been in place since 2005. The Houston Comets and Minnesota Lynx hold the distinction of having won the most championships with 4 titles each. The Comets folded in 2008. The Lynx have the most appearances in the championship with 6, all occurring in the 7-year period from 2011-2017. In 2011, a decade and a half after the launch of the WNBA, only two players remained from the league's inaugural season in 1997: Sheryl Swoopes and Tina Thompson. 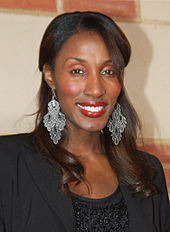 Lisa Leslie was the longest-tenured player from the 1997 draft class; she spent her entire career (1997–2009) with the Los Angeles Sparks. Sue Bird holds both of the league's most significant longevity records—number of seasons in the league (16) and games played (508). The members of the WNBA's All-Decade Team were chosen in 2006 on the occasion of the tenth anniversary of the WNBA from amongst 30 nominees compiled by fan, media, coach, and player voting. The team was to comprise the 10 best and most influential players of the first decade of the WNBA, with consideration also given to sportsmanship, community service, leadership, and contribution to the growth of women's basketball. Players for the WNBA's Top 15 Team were chosen in 2011 on the anniversary of the league's fifteenth season from amongst 30 nominees compiled in a similar manner to that of the All-Decade Team process. This process was repeated for the league's 20th anniversary season in 2016 with the selection of the WNBA Top 20@20. Over 30 players have scored at least 3,000 points in their WNBA careers. Only nine WNBA players have reached the 6,000 point milestone: Diana Taurasi, Tina Thompson, Tamika Catchings, Cappie Pondexter, Katie Smith, Lisa Leslie, Sue Bird, Candice Dupree, and Lauren Jackson. The scoring average leader is Cynthia Cooper, who averaged 21.0 points per game in five seasons with the Houston Comets (1997–2000, 2003). In 2007, Paul Westhead of the Phoenix Mercury became the first person to earn both NBA and WNBA championship rings as a coach. In 2008, 50-year-old Nancy Lieberman became the oldest player to play in a WNBA game. She signed a seven-day contract with the Detroit Shock and played one game, tallying two assists and two turnovers in nine minutes of action. By playing in the one game Lieberman broke a record that she herself had set in 1997, when she was the league's oldest player at 39. Sue Bird, who has played for the Seattle Storm since 2002, holds the record for career assists with 2,831 in 508 regular-season games. The record for most assists per game is currently held by Courtney Vandersloot, an American who also holds a Hungarian passport and represents that country internationally. She has averaged 5.77 assists per game during her career with the Chicago Sky (2011–present). Vandersloot also has the top two seasons in assists per game with 8.1 in 2017 and 8.6 in 2018. Around the beginning of September (or late August in Olympic and FIBA World Cup years), the regular season ends. It is during this time that voting begins for individual awards. The Sixth Woman of the Year Award is given to the best player coming off the bench (must have more games coming off the bench than actual games started). The Rookie of the Year Award is awarded to the most outstanding first-year player. The Most Improved Player Award is awarded to the player who is deemed to have shown the most improvement from the previous season. The Defensive Player of the Year Award is awarded to the league's best defender. The Kim Perrot Sportsmanship Award is awarded to the player who shows the outstanding sportsmanship on and off the court. The Coach of the Year Award is awarded to the coach that has made the most positive difference to a team. The Most Valuable Player Award is given to the player deemed the most valuable for her team that season. The newest WNBA award is the Basketball Executive of the Year Award, first presented in 2017 to the team executive most instrumental in his or her team's success in that season. Also named are the All-WNBA Teams, the All-Defensive Teams, and the All-Rookie Team; each consists of five players. There are two All-WNBA teams, consisting of the top players at each position, with first-team status being the most desirable. There are two All-Defensive teams, consisting of the top defenders at each position. There is one All-Rookie team, consisting of the top first-year players regardless of position. Winners are from the most recent season unless otherwise indicated. ^ "Votes" are listed as first-place votes, although the winner for all WNBA awards apart from the Peak Performer Awards is determined by points earned rather than first-place votes. Lauren Jackson, one of the most notable players in WNBA history. Number 15 was retired by Seattle Storm in her honour. ^ Number retired by the franchise when it was playing as the San Antonio Stars. Hammon played the last eight seasons of her WNBA career in San Antonio. Elena Baranova, Russia – the first international player in the WNBA (1997), one-time All-Star (2001). Some of these players, among them Penicheiro, Sutton-Brown, and Young, played U.S. college basketball. The three-point line is 22 ft 1.75 in (6.75 m) from the middle of the basket, 22 ft (6.71 m) at the corners, which is similar to the distance used under new FIBA rules; FIBA had increased its three-point distance on October 1, 2012 (for domestic competitions), but is 4 in (10.16 cm) shorter at the corners. The regulation WNBA ball is a minimum 28.5 inches (72 cm) in circumference and weighs 20.0 ounces (570 g), 1 inch (2.5 cm) smaller and 2 ounces (57 g) lighter than the NBA ball. Since 2004, this size has been used for all senior-level women's competitions throughout the world in full-court basketball. Competitions in the half-court 3x3 variant used the women's ball until 2015, when a dedicated ball with the circumference of the women's ball but the weight of the men's ball was introduced. Quarters are 10 minutes in duration instead of 12. Games are divided into four 10-minute quarters as opposed to the league's original two 20-minute halves of play, similar to FIBA and NCAA women's college rules (many WNBA players play in European, Chinese, or Australian leagues, which all use the FIBA rule set). The winner of the opening jump ball shall begin the 4th quarter with the ball out of bounds. The loser shall begin with the ball out of bounds in the second and third quarter. Previously under the two-half format, both periods started with jump balls, presumably to eliminate the possibility of a team purposely losing the opening tip in order to gain the opening possession of the second half. This is not a problem under the four-quarters because the winner of the opening tip gets the opening possession of the final period. The shot clock was decreased from 30 to 24 seconds. The rule changes signaled a move away from rules more similar to those of college basketball and toward those that provide a more NBA-like game. FIBA also uses a 24-second clock. The amount of time that a team must move the ball across the half-court line went from 10 to 8 seconds. A referee can grant time-outs to either a player or the coach. Two free throws and possession of the ball for clear-path-to-the-basket foul. Previously only one free throw was awarded as well as possession. In 2012, the WNBA added the block/charge arc under the basket. As of 2013 the defensive three-second rule and anti-flopping guidelines were introduced. The three-point line was also extended; in 2017, that line extended into the corners to match the NBA's. Since 2017, Tissot is the official timekeeper for the league, as it uses a unified game clock/shot clock system. *All dimensions are in line with NBA regulations except the three-point arc. The WNBA did not start out able to support itself. During the mid-2000s, the NBA spent more than $10 million per year to keep the WNBA financially solvent. In 2007, teams were estimated to be losing $1.5 million to $2 million a year. The league has begun to do better financially in recent years. In December 2010 Donna Orender said that the league had its first-ever "cash flow positive" team (Connecticut Sun) for the 2010 season. In 2011, three teams were profitable, and in 2013, six of the league's 12 teams reported a profit. The league has also signed extended television contracts with ESPN and sponsorship agreements with Boost Mobile. As the popularity of the league has grown, players have gained more voice and power to perform as activists in many fields. One of the league's main focus is the inequality between men and women's sports. Many players like Brittney Grinner, Breanna Stewart, Maya Moore have spoken about equality between gender, sexual orientation, and race. They have also supported social and political movements like Black Lives Matter, and others. On June 1, 2009, the Phoenix Mercury was the first team in WNBA history to announce a marquee sponsorship. The team secured a partnership with LifeLock to brand their jerseys and warm-ups. It was the first branded jersey in WNBA history. Following the expiration of the LifeLock deal, the Mercury secured a new uniform sponsorship deal with Casino Arizona and Talking Stick Resort on February 3, 2014. Indiana Fever – Salesforce.com; team was formerly sponsored by Finish Line, Inc. The now-relocated Tulsa Shock (Osage Casino) and San Antonio Stars (H-E-B) had jersey sponsorships at one time. On August 22, 2011, the WNBA announced a league-wide marquee sponsorship with Boost Mobile. The deal would allow the Boost Mobile logo to be placed on eleven of the 12 teams' jerseys (excluding San Antonio) in addition to branding on the courts and in arenas. A source said the deal is a "multiyear, eight-figure deal". On March 14, 2016, the WNBA completed a deal with Verizon Wireless to place its name on the front of 10 of 12 team jerseys, excluding the Stars and Sun, as well as in-arena advertising, and reserved commercial space during WNBA broadcasts. The deal also includes the sponsorship of the All-Star Game, Inspiring Women Luncheon, and other unspecified events, but not the Monthly and Yearly Awards. On March 28, the league introduced new uniforms bearing the new Verizon sponsor name, which eliminated white jerseys and made the secondary color a basis for a uniform. The jersey font remained unchanged, as well as the primary color used for the away uniform. Teams can use either jersey for home and away games. Pictures of the jerseys can be viewed on the WNBA website. In 2009, the Phoenix Mercury became the first American professional basketball team to feature advertisements on their uniform, when they sold an ad to LifeLock Insurance on the front of their jerseys, leading many people to wonder if ads on NBA uniforms were coming soon. Since then several other WNBA teams have followed suit. The NBA announced in the summer of 2016 that they will begin to feature advertisements on jerseys, with the first team to do so being the Philadelphia 76ers (with a StubHub sticker now on their jerseys). Before the start of the 2011 season, every team announced a new look for their uniforms. The supplier of the uniforms for the league, Adidas, upgraded all teams to new high-tech designs, much like they did for the NBA prior to the start of their season. On April 8, 2019, the Women’s National Basketball Association (WNBA) announced a multiyear marquee partnership with AT&T, making the global communications and technology company the first non-apparel partner to have its logo featured on the front of all 12 team jerseys throughout the league. The jerseys officially debut during this week’s WNBA Draft presented by State Farm on April 10 at NIKE’s NYHQ. Sponsorships have come from major companies such as; Boost Mobile and Farmers Insurance. Pepsi and Nike have also partnered up with the WNBA. As of the 2019 WNBA season, the Atlanta Dream are the only team with no team sponsors. Prior to the 2009 season, the maximum team roster size was changed from 13 players (11 active and 2 inactive) to 11 players (all active). Any team that falls below nine players able to play due to injury or any other factor outside of the control of the team will, upon request, be granted a roster hardship exception allowing the team to sign an additional player or players so that the team will have nine players able to play in an upcoming game or games. As soon as the injured (or otherwise sidelined) player(s) is able to play, the roster hardship player(s)—not any other player on the roster—must be waived. In March 2014, the WNBA and players signed a new, 8-year collective bargaining agreement, increasing the number of players on a roster to 12. The WNBA Draft is held annually every spring. The minimum age is 22 years for American players and 20 years for international players, measured as of December 31 of the calendar year of the draft. The draft is three rounds long, with each of the 12 teams in the league (trades aside) getting three picks each. The draft order for the eight teams that made the playoffs the previous year are based on team records, and the team with the highest previous record will pick last. For the remaining top four picks, a selection process similar to the NBA Draft Lottery is conducted for the four teams that did not qualify for the playoffs. Previously, in 2008, a new six-year collective bargaining agreement was agreed upon between the players and the league. The salary cap for an entire team in 2010 was $827,000 (although it was later lowered to $775,000). By 2013 (the sixth year under this agreement), the cap for an entire team was $900,000. In 2010, the minimum salary for a player with three-plus years of experience was $51,000 while the maximum salary for a six-plus year player was $101,500 (the first time in league history that players are able to receive over $100,000). The minimum salary for rookies was $35,190. Many WNBA players supplement their salaries by playing in European, Australian, or more recently Chinese women's basketball leagues during the WNBA off-season. The WNBA has been criticized for paying female players less than their NBA counterparts. The decision of superstar Diana Taurasi to sit out the 2015 WNBA season was seen by some in the media as a harbinger of salary-related troubles in the future. The Russian club for which she was playing at the time, UMMC Ekaterinburg, offered her a bonus well in excess of the league's salary cap to sit out that season. Taurasi accepted, largely because she had not had an offseason since playing college basketball more than a decade earlier. Such offers have often been made to star American players, including Taurasi herself, but none were accepted until Taurasi did so in 2015. WNBA players are awarded bonuses for certain achievements. Some of the bonuses given by the league (amount is per player) include: WNBA champion: $10,500; Runner-up: $5,250; Most valuable player: $15,000; All-WNBA First Team member: $10,000; All-Star Game participant: $2,500. The following shows the top jersey sales since the start of the 2017 season. The following shows the top teams sales since the start of the 2017 season. In 2012, average attendance per game dropped from 7,955 to 7,457 (-6.3%). Attendance per game stayed consistent at around 7,520 per game. In 2015, the WNBA's attendance per game decreased by 3.4 percent to 7,318. This was a record low for the WNBA since it was created in 1997. Many teams have experienced drops in their attendance; (San Antonio Stars: -37.4%, Washington Mystics: -7.9%, Tulsa Shock: -7.2%) these losses have caused the attendance of the WNBA to drop. President Laurel Richie stated that after the 2015 season ends, they will create an expansion committee and begin evaluating if and how the WNBA should go about expanding their reach. The 2018 season had the lowest average attendance in WNBA history. However, about half of the decline in attendance from 2017 to 2018 was due to the New York Liberty moving from Madison Square Garden to the much smaller Westchester County Center. While the Liberty had averaged over 9,000 fans in 2017, James Dolan, then the team's owner, noted that roughly half of the team's attendance in that season came from complimentary tickets. At least one writer speculated that team moves—both relocations to new markets and moves to new arenas in existing markets—have made it difficult for WNBA teams to maintain fanbases. For example, of the 12 charter WNBA teams, only five remain in their original markets. An example of relocation within a market is that of the Chicago Sky; although they have never moved from the Chicago market, they have had three different home arenas. LA moved from The Forum to Staples Center prior to the 2001 season. HOU moved from Compaq Center to Toyota Center prior to the 2003 season. NY played six games at Radio City Music Hall in 2004. HOU moved from Toyota Center to Reliant Arena prior to the 2008 season. ATL moved temporarily from Philips Arena, now known as State Farm Arena, to McCamish Pavilion for the 2017 and 2018 seasons. CHI moved from UIC Pavilion to Allstate Arena prior to the 2010 season, and then to Wintrust Arena prior to the 2018 season. NY moved temporarily from Madison Square Garden to Prudential Center from 2011 through 2013, and permanently to Westchester County Center prior to the 2018 season (though still using the Garden as an alternate home). SA moved temporarily from AT&T Center to Freeman Coliseum for the 2015 season, and then moved to Las Vegas prior to the 2018 season and became the Las Vegas Aces. SEA will move temporarily from KeyArena to Alaska Airlines Arena for the 2019 season. TUL moved from Tulsa, Oklahoma to Arlington, Texas prior to the 2016 season and became the Dallas Wings. WAS will move from Capital One Arena to St. Elizabeths East Entertainment and Sports Arena for the 2019 season and beyond. Currently, WNBA games are televised throughout the U.S. by ABC, ESPN, ESPN2, Twitter and NBA TV. In the early years, two women's-oriented networks, Lifetime and Oxygen, also broadcast games including the first game of the WNBA. NBC showed games from 1997 to 2002 as part of their NBA on NBC coverage before the league transferred the rights to ABC/ESPN. In 2007, the WNBA and ESPN came to an 8-year television agreement. The agreement would be the first to pay television rights fees to the league's teams. Never before had an agreement promised rights fees to a women's professional league. The agreement ran from 2009 to 2016 and is worth millions of dollars. In June 2007, the WNBA signed a contract extension with ESPN. The new television deal runs from 2009 to 2016. A minimum of 18 games will be broadcast on ABC, ESPN, and ESPN2 each season; the rights to broadcast the first regular season game and the All-Star game are held by ABC. Additionally, a minimum of 11 postseason games will be broadcast on any of the three stations. Along with this deal, came the first ever rights fees to be paid to a women's professional sports league. Over the eight years of the contract, "millions and millions of dollars" will be "dispersed to the league's teams". In 2013 the WNBA and ESPN signed a six-year extension on the broadcast deal to cover 2017–2022. In the new deal, a total of 30 games would be shown each season on ESPN networks. Each team would receive around $1 million per year. From 2010 to 2011 the regular season broadcast drew 270,000 viewers a growth of 5 percent from 2010s’ numbers. As sponsorships continued to grow with deals from ESPN to air WNBA games on ESPN and ESPN 2. The league did experience some success on the digital forefront. It saw increases on its mobile page views by 26 percent along with a major increase in its social media space; Instagram grew by 51 percent this past year. In 2009, the WNBA announced the launch of WNBA LiveAccess, a feature on WNBA.com that provides fans with access to more than 200 live game webcasts throughout the WNBA season. All of the WNBA LiveAccess games are then archived for on-demand viewing. Most games (except broadcasts on ABC, ESPN or ESPN2, which are available on ESPN3) are available via this system. The first use of LiveAccess was the E League versus Chicago Sky preseason game. Prior to the 2011 season, LiveAccess was given an overhaul, and the system became more reliable and many new features were added. Before the 2012 season, it was announced that users of LiveAccess would have to pay a $4.99 subscription fee to use the service. In 2013, this was increased to $14.99. In 2014 the streaming service was renamed WNBA League Pass. 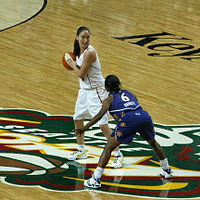 On the 2008 season opening day (May 17), ABC broadcast the Los Angeles Sparks and Phoenix Mercury matchup to showcase new rookie sensation Candace Parker. The game received a little over 1 million viewers. Ratings still remain poor in comparison to NBA games. In 2008, WNBA games averaged just 413,000 viewers, compared to 1.46 million viewers on ESPN and over 2.2 million on ABC for NBA games. In addition, WNBA games have much poorer visibility, attendance, and ratings than NCAA games. 1 The Connecticut Sun was known as the Orlando Miracle from 1999–2002. 2 The Dallas Wings were known as the Tulsa Shock from 2010–2015 and the Detroit Shock from 1998–2009. 3 The Las Vegas Aces were known as the Utah Starzz from 1997–2002, the San Antonio Silver Stars from 2003–2013, and the San Antonio Stars from 2014–2017. ^ Mechelle Voepel (February 10, 2016). "WNBA names Coca-Cola executive Lisa Borders president". ESPN. Retrieved February 11, 2016. ^ a b "WNBA President Lisa Borders Steps Down to Become First-Ever President and CEO of Time's Up". WNBA. October 2, 2018. Retrieved December 22, 2018. ^ "History – WNBA.com". WNBA.com. Retrieved 2016-06-18. ^ "Lisa Leslie, Sheryl Swoopes, Rebecca Lobo Reunited at WNBA Draft". WNBA.com – Official Site of the WNBA. Retrieved 2016-06-18. ^ a b "WNBA.com: History of the WNBA". www.wnba.com. Retrieved 2016-06-18. ^ "Voepel: Stern changed women's basketball". ESPN.com. Retrieved 2016-06-18. ^ "Penny Toler recalls landmark WNBA basket – ESPN Video". ESPN.com. Retrieved 2016-06-18. ^ "WNBA.com: WNBA History/Timeline". www.wnba.com. Retrieved 2016-06-18. ^ "Twenty years later, a look back at WNBA's first game". ESPN.com. Retrieved 2016-06-18. ^ "Detroit, Washington join WNBA lineup | chronicle.augusta.com". chronicle.augusta.com. Associated Press. Retrieved 2016-06-18. ^ "WNBA expands to Orlando, Minnesota | chronicle.augusta.com". chronicle.augusta.com. Associated Press. Retrieved 2016-06-18. ^ Bowman, James (2014-02-08). "A history of the WNBA collective bargaining agreement". Swish Appeal. Retrieved 2016-06-18. ^ "WNBA EXPANDS BY FOUR ... ARE MORE CITIES ON THE HORIZON? ", Sports Business Daily, June 8, 1999. ^ Sandomir, Richard (April 16, 2003). "W.N.B.A., Going on 7, Has Grown-Up Labor Dispute". The New York Times. Retrieved May 13, 2011. ^ "WNBA official 2006 rule changes". ^ "WNBA.com: WNBA History/Timeline". www.wnba.com. Retrieved 2018-11-08. ^ "DREAM: Atlanta's WNBA Team Named Atlanta Dream". ^ "The First Regular Season Outdoor Game in Professional Basketball History". Retrieved 15 September 2016. ^ "Shock makes move official". ESPN. October 20, 2009. Retrieved July 25, 2010. ^ Hurley, Michael (July 1, 2011). "NBA.com gets new lockout makeover". NESN.com. Retrieved July 17, 2011. ^ Abontorab99 (September 13, 2011). "WNBA Attendance". WNBA. Retrieved September 13, 2011. ^ "With rebound, WNBA solidifies spot at ESPN". ^ "No, the WNBA is Not a Major Sport (And That's Fine)". Sports Media Watch. ^ "Seattle Storm Set to Play 2019 WNBA Season at University of Washington's Alaska Airlines Arena" (Press release). Seattle Storm. August 15, 2018. Retrieved August 23, 2018. ^ Voepel, Mechelle (November 15, 2017). "Jim Dolan parting ways with New York Liberty was only a matter of time". ESPN.com. Retrieved November 24, 2017. ^ "MSG to Operate Liberty While Continuing to Pursue Sale, Westchester County Center to Serve as Team's Primary Home for 2018". New York Liberty. February 8, 2018. ^ "Nets minority owner Joseph Tsai buys WNBA's Liberty". ESPN.com. Associated Press. January 25, 2019. Retrieved January 25, 2019. ^ "WNBA Announces Relocation of San Antonio Stars to Las Vegas" (Press release). WNBA. October 17, 2017. Retrieved November 24, 2017. ^ "WNBA Career Leaders and Records for Points Per Game". Basketball-Reference.com. Retrieved August 28, 2018. ^ "Cynthia Cooper WNBA Stats". Basketball-Reference.com. Retrieved August 29, 2018. ^ "WNBA Career Leaders and Records for Assists". Basketball-Reference.com. Retrieved August 28, 2018. ^ "Sue Bird WNBA Stats". Basketball-Reference.com. Retrieved August 28, 2018. ^ "WNBA Career Leaders and Records for Assists Per Game". Basketball-Reference.com. Retrieved August 28, 2018. ^ "WNBA Single Season Leaders and Records for Assists Per Game". Basketball-Reference.com. Retrieved August 28, 2018. ^ "Detroit's Plenette Pierson Named 2007 WNBA Sixth Woman of the Year". WNBA. ^ "Cambage, Fowles And Vandersloot Earn 2018 WNBA Peak Performer Awards" (Press release). WNBA. August 28, 2018. Retrieved September 5, 2018. ^ "Stars Retire Becky Hammon's Jersey". WNBA. June 27, 2016. Retrieved June 28, 2016. ^ "Lynx to honor Whalen with first retired number". ESPN.com. Associated Press. April 18, 2019. Retrieved April 18, 2019. ^ "WNBA Announces Rule Changes for 2006". WNBA.com. December 6, 2005. Retrieved June 13, 2011. ^ "WNBA Announces Rule Changes for 2007 Season". WNBA.com. January 30, 2007. Retrieved June 13, 2011. ^ "WNBA Fails to Thrill Fans". The Hoya. October 15, 2012. Retrieved April 15, 2013. ^ Lieber Steeg, Jill (June 12, 2007). "New owners stake claim in overhauling WNBA". USA Today. Retrieved June 13, 2011. ^ Rohlin, Melissa (December 3, 2010). "Donna Orender, David Stern on WNBA". Los Angeles Times. Retrieved November 7, 2015. ^ Paulsen (February 28, 2014). "No, the WNBA is Not a Major Sport (And That's Fine)". Sports Media Watch. Retrieved November 7, 2015. ^ "Hoops Happening: Today in women's basketball". Tamryn Spruill. May 1, 2018. Retrieved September 15, 2018. ^ Shoichet, Catherine E.; Martin, Jill (12 July 2016). "Off-duty cops walk out over WNBA players' Black Lives Matter shirts". CNN. Retrieved 29 December 2018. ^ "Mercury, LifeLock Break New Ground with Partnership". WNBA.com. June 1, 2009. Retrieved June 13, 2011. ^ "Phoenix Mercury Announces Marquee Partnership with Casino Arizona and Talking Stick Resort". WNBA.com. February 3, 2014. Retrieved May 16, 2014. ^ "Boost Mobile and WNBA Form First-Ever Leaguewide Marquee Sponsorship". WNBA.com. August 22, 2011. Retrieved August 22, 2011. ^ "WNBA lands Boost Mobile as top sponsor". Sports Business Journal. August 22, 2011. Retrieved August 22, 2011. ^ "Verizon stakes out space on WNBA jerseys". ^ "WNBA, players' union agree to 8-year CBA". ^ "Women's basketball salary". Archived from the original on 2013-08-01. Retrieved 2013-03-01. ^ "Women's basketball 2008" (PDF). Archived from the original (PDF) on 2013-08-01. Retrieved 2013-03-01. ^ Berri, David (12 August 2015). "Basketball's Gender Wage Gap Is Even Worse Than You Think". VICE Sports. Archived from the original on 6 April 2016. Retrieved 5 April 2016. ^ Fagan, Kate (February 4, 2015). "Diana Taurasi's decision to sit out should spark WNBA salary changes". ESPN.com. Retrieved September 14, 2015. ^ "womensbasketballonline.com". Archived from the original on 2013-08-01. Retrieved 2013-03-01. ^ "With 20th season ahead, league sees attendance, ratings drop". www.sportsbusinessdaily.com. Retrieved 2016-10-02. ^ "WNBA: Dip in attendance lowest in league history". MSU Reporter. Retrieved 2019-01-31. ^ a b c Lombardo, John (September 21, 2015). "With 20th season ahead, league sees attendance, ratings drop". Street & Smith's Sports Business Journal. Retrieved October 3, 2015. ^ Evans, Jayda (August 20, 2014). "WNBA attendance up 1 percent and increased viewership". Seattle Times. Retrieved November 20, 2014. ^ The Sports Xchange (September 16, 2015). "2015 WNBA season sees lowest fan attendance in league history". Las Vegas Review-Journal. Retrieved October 3, 2015. ^ Favor, Sue (September 21, 2016). "WNBA's 20th season sees highest attendance in five years". womenshoopsworld.com. Retrieved September 22, 2016. ^ Feinberg, Doug (September 7, 2017). "WNBA Scores Highest Attendance In Six Years During Record-Breaking Season". The Spokesman-Review. Retrieved January 24, 2018. ^ a b Evans, Jayda (July 16, 2007). "WNBA gets first TV rights fee". Seattle Times. Retrieved May 13, 2011. ^ "WNBA agrees to new TV deal with ESPN/ABC". 15 July 2007. ^ Lefton, Terry. "ESPN Signs Six-Year Extension With WNBA That Is Worth $12M Per Year". SportsBusiness Daily. Retrieved 2013-05-21. ^ "WNBA attendance, TV numbers increase again". Retrieved 2016-10-02. ^ "WNBA.com to Webcast More than 200 Games During 2009 WNBA Season". WNBA.com. May 13, 2009. Retrieved June 13, 2011. ^ Glass, Alana (September 27, 2013). "WNBA Captures Fans, Ends Regular Season With Record Growth". Forbes. Retrieved January 10, 2014. ^ Ourand, John; Karp, Austin (November 11, 2013). "With rebound, WNBA solidifies spot at ESPN". sportsbusinessdaily.com. Sports Business Journal. Retrieved November 12, 2013. ^ Lombardo, John (August 18, 2014). "WNBA expects at least six teams to post profit". sportsbusinessdaily.com. Street & Smith's Sports Business Daily/Global/Journal. Retrieved August 20, 2014. ^ Sundalow, Brian (September 18, 2014). "WNBA sees ratings jump in postseason". Chicago Sun-Times. Retrieved November 12, 2014. ^ "More Ratings: Paralympics, World Cup of Hockey, WNBA on ESPN — Sports Media Watch". ^ Karp, Austin (September 8, 2017). "Audience Analysis: WNBA Regular-Season Viewership Hits New Low For ESPN/ESPN2". Street & Smith's Sports Business Daily. Retrieved May 7, 2018. ^ Zeigler Jr., Cyd (October 2, 2008). "WNBA Ratings up but Still Not Good". Outsports.com. Retrieved June 13, 2011. ^ Payne, Marissa (6 May 2015). "Former U-Conn. star Maya Moore laments the current state of the WNBA". Washington Post. Retrieved 5 April 2016. Evans, Jayda (July 16, 2007). "WNBA Gets First Rights Fee". The Seattle Times. Retrieved July 16, 2007. Heath, Thomas (July 12, 2006). "A Matter of Value". The Washington Post. Retrieved July 12, 2006. "Minimum NBA Salary". Inside Hoops. August 10, 2005. Retrieved September 4, 2006. "Salary Cap for 2004-05 Is $43.87 million". National Basketball Association. July 13, 2004. Retrieved July 13, 2004. "History of the WNBA". Women's National Basketball Association. Retrieved September 4, 2006. "Start of Season Conference Call". Women's National Basketball Association. May 14, 2007. Retrieved May 14, 2007. "Hoops Happening: Today in women's basketball". Tamryn Spruill. May 1, 2018. Retrieved September 15, 2018. Wikimedia Commons has media related to Women's National Basketball Association.